We may not be together in the way we used to be. We are still connected by a cord no eye can see. So whenever you need to find me, we're never far apart. If you look beyond the horizon and listen to your heart. On November 17th, I helped my best friend cross the Rainbow Bridge. I will always miss you Lager-Dogger, Lars, Senor Moreno, Mr. Brown, Doodlehead. All my dogs are special to me, but Lager was my soulmate. Not a day goes by that I don't still miss this dog. Lager finished his US championship in 1997, completely from the Bred-By Exhibitor class, at 14 months old with a Best Junior in Sweeps and two BOS over specials and finished his Canadian championship in 3 shows. Tremendous topline and tailset and extremely sound. Rich liver spotting on a pure white background, tight feet and a flawless coat finish out the package. Even nicer to live with than he is to look at! Has a sweet grin he's willing to to share with anyone. Truly a "liver lover." 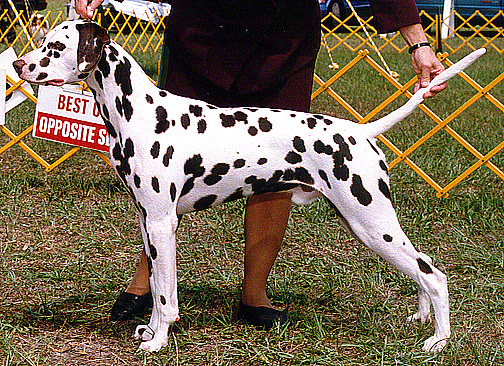 Award of Merit winner (entry of 54 specials) at the National Specialty supported Detroit Dalmatian Club Show as well as multiple BOB wins and a group placement in extremely limited showing. In 1999, Lager finished Novice Agility, Novice Jumpers with Weaves, Companion Dog and Road Dog (at the DCA National Specialty) titles. In 2000, he completed his Companion Dog Excellent, Open Agility and Open Jumpers with Weaves and Excellent Jumpers with Weaves ( in just 3 straight shows!) titles. Summer of 2003 saw Lager visit Canada again to complete his Canadian Companion Dog and Road Dog titles. Lager returned to the obedience ring in 2005 to star in the Rally ring. Finishing his Rally Novice title in 3 straight show, he quickly finished Rally Advanced and Excellent titles with his only NQ due to handler error! 2007 saw Lager return to the DCA National Specialty where he won the 10 and older Veteran's Class and earned a 4th in Veteran's obedience (losing a run-off to daughter Tequiza). Lager is the first Dalmatian to earn both the Conformation and Performance Versatility Awards from the Dalmatian Club of America!